Abell 1689, shown in this composite image, is a massive cluster of galaxies located about 2.3 billion light years away that shows signs of merging activity. 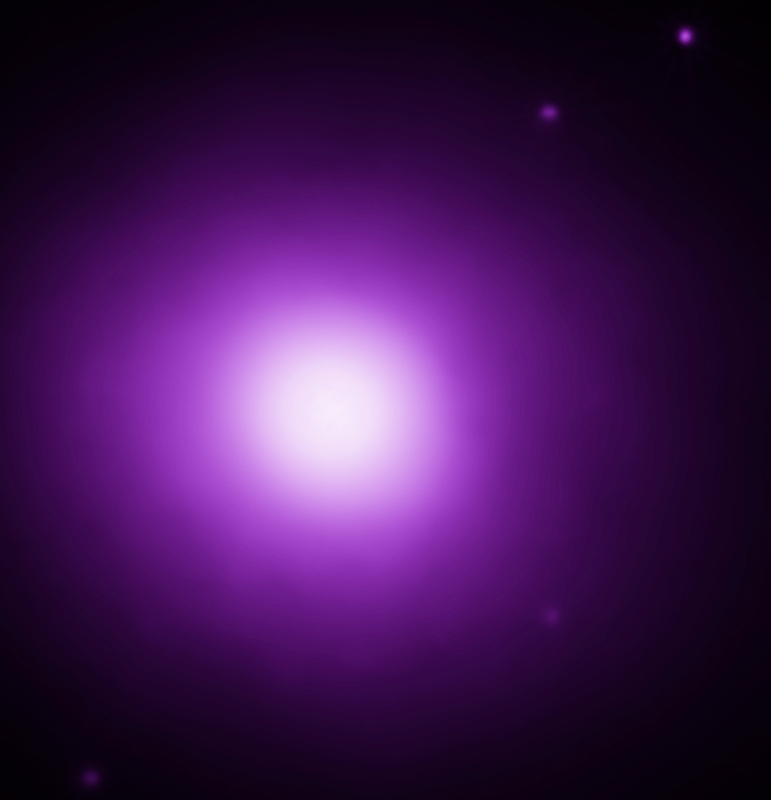 Hundred-million-degree gas detected by NASA's Chandra X-ray Observatory is shown as purple in this image, while galaxies from optical data from the Hubble Space Telescope are colored yellow. The X-ray emission has a smooth appearance, unlike other merging systems such as the Bullet Cluster or MACS J0025.4-1222. The temperature pattern across Abell 1689 is more complicated, however, possibly requiring multiple structures with different temperatures. The long arcs in the optical image are caused by gravitational lensing of background galaxies by matter in the galaxy cluster, the largest system of such arcs ever found. 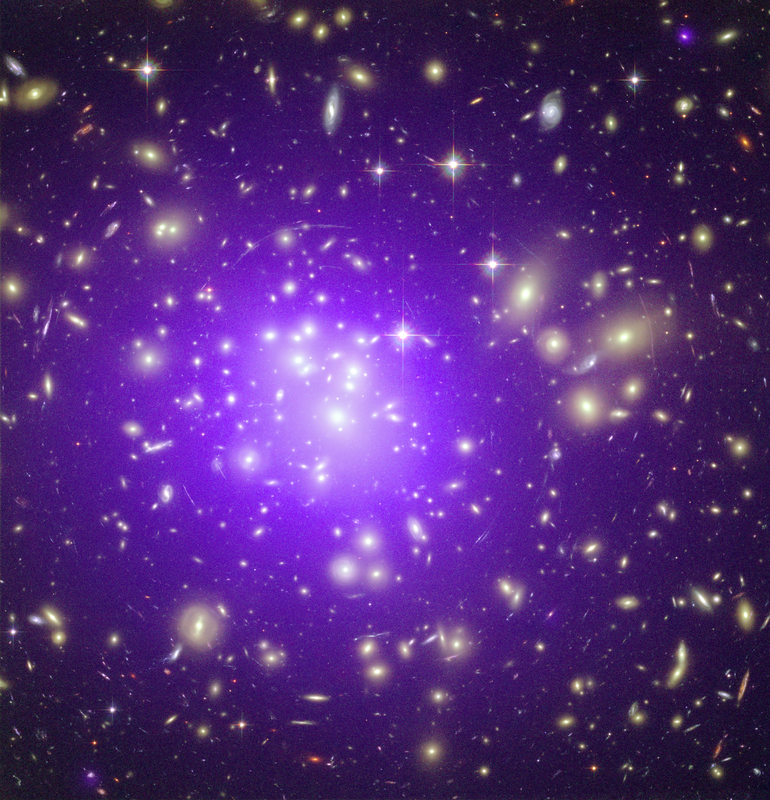 Further studies of this cluster are needed to explain the lack of agreement between mass estimates based on the X-ray data and on the gravitational lensing. Previous work suggests that filament-like structures of galaxies are located near Abell 1689 along our line-of-sight to this cluster, which may bias mass estimates using gravitational lensing. Coordinates (J2000) RA 13h 11m 34.20s | Dec +01° 21´ 56.00"
wow, awesome, each galaxy looks like flying birds and whole pic makes we are one in cosmos. Chandra telescope has been one of the best project from NASA. I have enjoyed a lot of photos from it. I hope all this science material developed a more scientific thinking in all people. It will help us for finishing all religions beliefs and all hate that develop in human beings. Looks like every other pixel in the above photograph is a galaxy. Every Galaxy has a billion stars and only god knows how many planetary systems. It will be highly pessimistic to say we are alone in this whole cosmos.